A great landscape starts with a great concept. 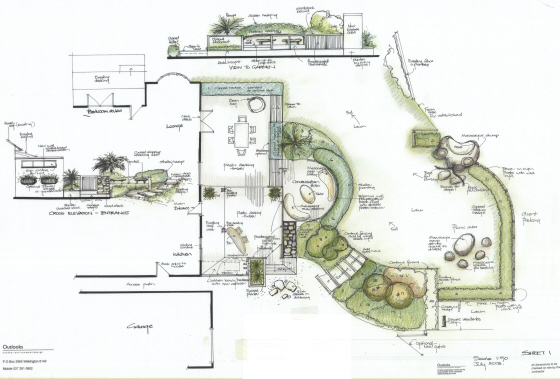 We work with landscape designer Rosemary Nelson of Outlooks Environmental Design who will bring your ideas together with concept designs before we construct your landscape. How do I start my Landscape Design? Getting your ideas down on paper or taking photos of things that you like are good starting points in preparation for the consultation process. Concept Design drawings can be created after the consultation if they are required. You can even explore possibilities: how do you want to use the area, do you want to improve your outdoor living area, add street appeal or reduce maintenance. A designer will be able to make suggestions and work with you to develop a design you will be delighted with. If your project is more complex then working drawings, Permits or Building Consents may be needed before work can start. Design by Rosemary Nelson – Outlooks Environmental Design. Creating a plan is an important stage in creating a landscape. Whether it's a concept plan that shows layout or a more detailed construction plan it is important that you can see that your vision can be realised. Once you have discussed your ideas with the designer the concept plan can be drawn to show you how the various features of the landscape can be arranged. The concept plan outlines the positioning of paths, walls, decks, steps, fences etc., together with lawn and garden arrangements and suggested features and plants. With the experience of constructing landscapes in the Wellington region for over 20 years to call on you can be sure that we are able to take local conditions into account when planning your new landscape. We have worked with Rosemary Nelson - Outlooks Environment Design for a number of years now, her designs and consultation process have been able to develop our clients' needs, wants and wishes into plans that are creative and achievable. If you have already chosen your Landscape Architect or Designer then we will happily work with those plans.